Maybe I put too much stock in coaching in college football. The coaches themselves always seem to say it's about the players, which is possibly just a way to deflect attention. Or maybe it's true. I'd still chose coaching. Say you made me a hypothetical athletic director, asked me to hire a coach for the next 10 years and gave me the following criteria: I could either have the best coach in the country for 10 years or I could get an average coach but my program would be guaranteed to have the best talent in the country for those same years. I would pick the coach 100 out of 100 times. So, any time it is time to look at a game, I like to consider which team has the coaching edge. Which team would you say has that in Saturday's Nebraska-Wisconsin game? That's bound to be a subjective answer, but I would give a slight edge to Nebraska. Paul Chryst has won 15 of his first 20 games at Wisconsin, but given the relationship between Chryst and Mike Riley, I like the person in the "mentor" role. Give me Obi Wan over Luke Skywalker, I suppose. These grades are determined by relating on the field results and per play efficiency vs the roster talent each coach has against the talent of his opponents. In other words, the larger the talent advantage a coach has over his opponents; the better his results should be and the grade reflects that. For example, a coach could have ‘B’ level results or efficiency; but if he has an ‘A’ grade talent gap over his opponents his TAG will be ‘C’ because he is under performing his talent. A few more things to note; I don’t consider a coach’s grade reliable until after he’s been in our database 3 or more years. Also, the grades do not reflect the trajectory of a coach; only his performance to date. Riley has nine years in the CFBMatrix database and ranking of B-. That currently ranks sixth among Big Ten head coaches with at least three years under their belt -- Jim Harbaugh and Urban Meyer are tired for first (A+), Mark Dantonio and Pat Fitzgerald are tied for third (A-) and Kirk Ferentz is fifth (B+). Where's Chryst? I was a little shocked by this, but he's all the way down at a D+ with five seasons in the database. I'm assuming that's based mostly on going 19-20 over three years at Pitt, and one of those years was in the weak Big East. I wouldn't say Nebraska has that big of an edge on Saturday -- not even close -- but again, that's just my feeling. CFBMatrix also includes offensive and defensive coordinator grades. Danny Langsdorf (eight seasons) gets a B, which ranks third in the Big Ten. Mark Banker (nine seasons) gets a C, which, in telling fact about this conference, ranks sixth among DCs with at least three years in the database. There are four Big Ten DCs in that group with A+ grades. If you eliminate the three-year minimum, Banker drops to ninth. I'm not surprised that Langsdorf if the highest graded of Nebraska's three main coaches. I would probably have them in a similar order. If that's accurate, I think it's how Husker fans would want them ordered for this specific game. 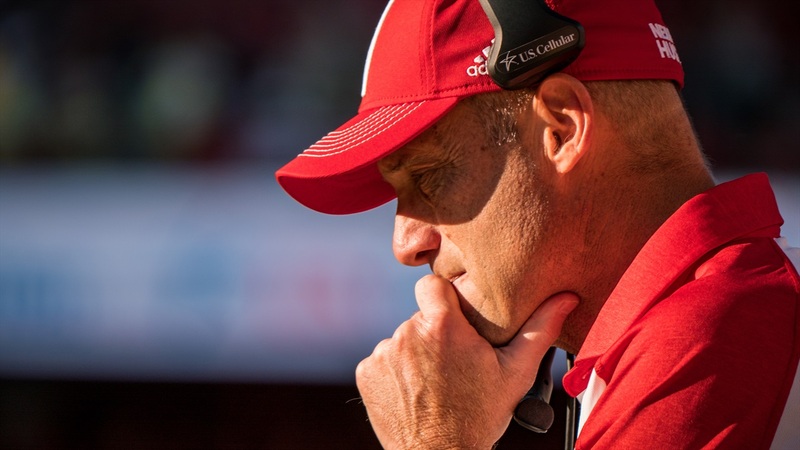 Langsdorf has faced a big challenge given the injuries the last couple of weeks. Now through one of the top defenses in the conference on top of that and Nebraska is going to need a big game out of him. Elizabeth Merrill of ESPN on how Mike Riley has kept football in perspective following the loss of Sam Foltz. Really good read from Jeff Sheldon of the Omaha World Herald on Nebraska volleyball's Tiani Reeves finding her voice on the issue of racial profiling. Starting in 2019-20 the NCAA will begin distributing some of the money from its March Madness TV deal based on academic performance. Husker fan Kent Titze, whom you may recognize as the guy who looks a lot like Herbie Husker, is in the running for the "best fan ever" title from USA Today. Vote here. ICYMI: Here's yesterday's practice report from Jacob Padilla and Erin Sorensen has the story of Drew Brown's role as an uncle that you don't want to miss.